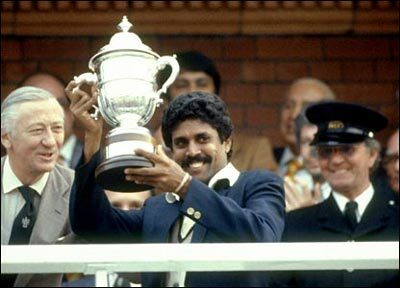 Three words describe Kapil Dev – Positive, Dynamic and Inspirational. Not many have all these qualities , and know how to use the same. Kapil Dev is one kind of a guy like that. Often referred to as the ‘Haryana Hurricane’ – a tag he made his own with his lethal and deadly bowling. As a batsman, he had an attitude that is only equal to a daredevil. He was ‘swashbuckling’ whenever he came to bat. The most promising part from Kapil Dev was his firmness and agility, which was an uncommon trait to found in Indian cricketers those days. He was a complete package in all, earning the tag of one of the best all-rounders India has ever produced. 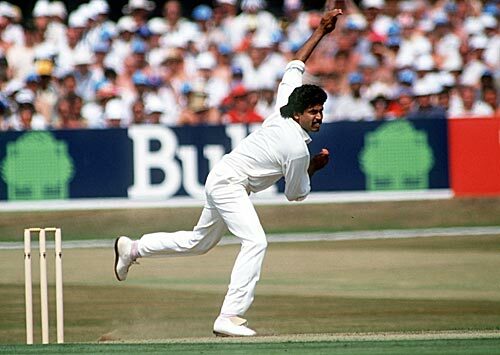 Kapil Dev was one of the best out-swing bowlers and still continues to be. Kapil Dev made his ODI debut for India in October 1978 at Quetta, against Pakistan. Later in the month he made his test debut against Pakistan. Since then he has gone on to play in 131 tests for India, with just one break on non-cricketing matter. During his lifetime as a test cricketer he aggravated 5248 runs at an impressive avg of 31.05 and capturing 434 wickets at a stunning economy rate of 2.78. What makes Kapil Dev exemplary was the fact that he was born in a country and played most of his cricket which was really hard to the fast bowlers. 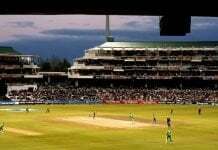 The pitches in India really was slow, suited the spinners better and provided no assistance whatsoever for the fast bowlers. In spite of that, he continued to give his 100% for the country and served the team with merit. Kapil had a side-on action which was nothing short of flawless. When you have a side-on action it is quite usual that head drops , but Kapil ensured that it wasn’t happening. He always believed practice, practice and more practice as keys to success. He had a notion that if a pace bowler could bowl at least 100 overs in the nets everyday he could stay fit most of the time, and the mantra worked too well for him. Kapil Dev as a batsman was an un-orthodox batsman who didn’t even care about the weight of the opposition. He redefined each shot in the batting manual. He invented the ‘nataraja’ shot which he used the world over. He might have been un-orthodox but when the time came he rose to the occasion. The 175* he played in the 1983 world cup was nothing short of magical. The innings features in Top 10 ODI batting performances compiled by Wisden in 2002. After Kapil Dev, took over captaincy of the Indian team in 1982, this was the biggest occasion he has been. India had a pretty ordinary squad on paper, and even their captain Kapil Dev had pretty ordinary figures. None gave India a chance in the World Cup, given the fact that the Clive LLoyd led West Indian outfit was supreme in cricket much like the Australian team in the ealrly 2000’s. Kapil was extremely instrumental in India being the World Cup Champs. Thanks to the heroics of Roger Binny, Kapil Dev himself India entered the World Cup finals, where no one gave even a chance. Firstly, India stunned the world by entering the world cup finals. Finally India beat West Indies in the finals and won the 1983 Prudential World Cup. West Indies, who were looking for a hat-trick of titles in the World Cup, but Kapil Dev & co had other plans. West Indies, having restricted India for 183 runs, thought they had the game in hands and took guard. They had the dangerous Viv Richards who literally was doing a massacre out there. Then came the defining moment of the World Cup. Viv Richards, skied Madan Lal and Kapil Dev did the impossible. He ran 20 yards backwards and caught one of the most impossible catches in cricket history. Even today, that catch is regarded as one of the best ever catches in ODI cricket history. Kapil Dev , the name says it all. 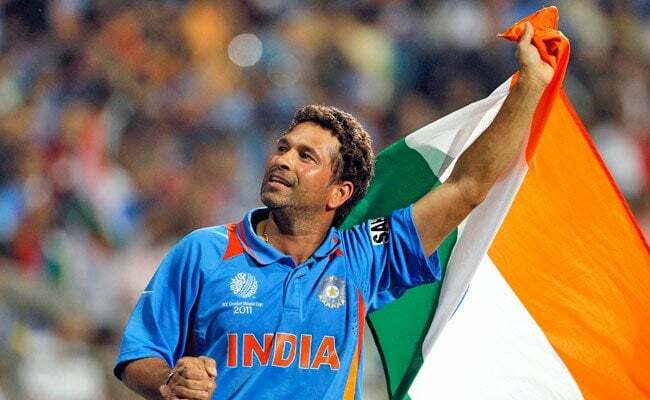 As an honour for his achievements he was rightly inducted into the ICC Hall of Fame in 2010. Kapil Dev could have been known as the greatest all-rounder had he not played cricket in the time of Botham and the Pakistani great Imran Khan.